Modern advances have created innovative options for some surgeries. 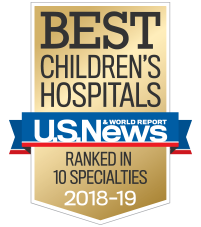 At Children’s, we use methods—often called laparoscopic or thoracoscopic surgery—to reduce the pain and recovery time compared to traditional surgery. During minimally invasive surgery, our surgeons use a tube with a camera attached—called an endoscope—to go into a child's body and send images to a TV monitor. The images guide the surgeon through the surgery. To perform the surgery, the surgeon uses small, thin tools that go through small incisions in a child's body. In laparoscopic surgery, the tube is passed through the abdomen, usually the belly button. In thoracoscopic surgery, it is passed through a small incision in the chest. Our surgeons are highly experienced in these methods and perform then every day. Intraoperative magnetic resonance imaging (iMRI), which allows our surgeons to clearly and effectively navigate the digestive system. The imaging helps surgeons pinpoint the correct placement of new tissue to repair or replace. Single-site colectomy, to treat life-threatening ulcerative colitis, diseases that inflame the large intestine. Not every child can benefit from minimally invasive surgery. We will talk to you about surgical options for your child. Our surgeons are pediatric-trained to perform minimally invasive surgery on children and teens. We will create a surgery and follow-up plan just for your child, and we will make sure you feel confident caring for him when he goes home.